I would like to extend my warmest welcome to the woman leaders, the peace leaders, and the members of WFWP from 194 nations, who have come to the Cheongshim Peace World Center in Korea to take part in the historic Abel Women UN Inauguration Assembly. From our early days, my wife and I have upheld Heaven's will and proclaimed the vision of the peaceful world originally envisioned at the time of the Creation. We have come here today, having returned from America after completing our busy providential schedule there, in order to establish the Abel Women UN. The Abel Women UN has the mission of realizing the providential goal of creating, on earth, a world of lasting peace, without conflict or war. As my wife, Hak Ja Han Moon, and I have already proclaimed, Korea is God's homeland. 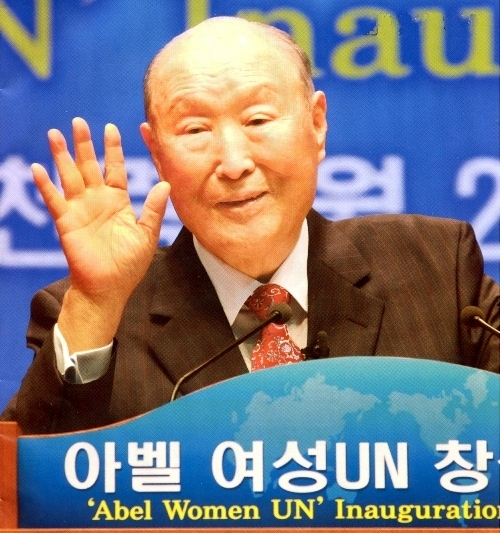 Therefore, the inaugural assembly for the Abel Women UN, which will play the providential role of leading the establishment of a new world of peace, must take place here in Korea in accordance with God's will. Beloved woman leaders from around the world! As you are well aware, representatives of all the world's peoples, which had been suffering from the aftermath of World War II, founded the United Nations according to God's will and with a yearning for peace. In June 1945, representatives from forty-five nations met in San Francisco in the United States to sign the United Nations Charter. Today, with 193 member nations, the UN has developed into a unique organization in the world with the purpose of maintaining global peace. Respected peace-seeking leaders from around the world! What is the reality today? In the sixty years of the United Nations' existence, it has been unable to prevent wars breaking out, including the Korean War. Even though the cold war has ended, the world is not free from outbreaks of war, whether big or small, that stem from conflicts between rich and poor, between races, and between people of different faiths. Hasn't the UN seen repeated breakdown of its work to fulfill its original mission to maintain global peace, according to the purpose of its founding? At the time of its inauguration, the UN was the result of a compromise effected between the U. S. and the then Soviet Union under the confrontational structure of the cold war. From the outset, therefore, it was limited in its ability to bring about lasting world peace transcending the interests of individual nations. This is why I have proclaimed that from the standpoint of God's will, the UN has been unable to emerge from the position of Cain. This is why we emphasize that the renewal of the UN is absolutely critical to building a world of lasting peace as originally envisioned at the time of the Creation. To carry this out in more concrete form, I maintain that an Abel-type inter-religious and international peace council should be organized within the UN. The UN should be reorganized into a bicameral system, with the present UN General Assembly -- the arena of individual nations competing over their own interests -- serving as the lower house, and the inter-religious and international peace council consisting of global religious leaders serving as the upper house. I have already presented this proposal of renewal to the UN, and the Philippines, as a representative nation, has also done so. The United Nations has struck a brick wall, being unable to move beyond the level of balancing the various interests of individual nations. Isn't that the case? In history up to now, we have depended on government organizations centered on men to bring about global peace. Now, however, to surmount the limitations they have demonstrated, I believe that a women's peace movement centered on a nongovernmental organizations (NGO) should take root as the new system resolving problems that arise in the field. And this women's peace movement cannot be carried out by an individual or an NGO; rather, it can only be made possible through a global organization with solidarity, and that is why today's inauguration of the Abel Women UN is absolutely necessary. 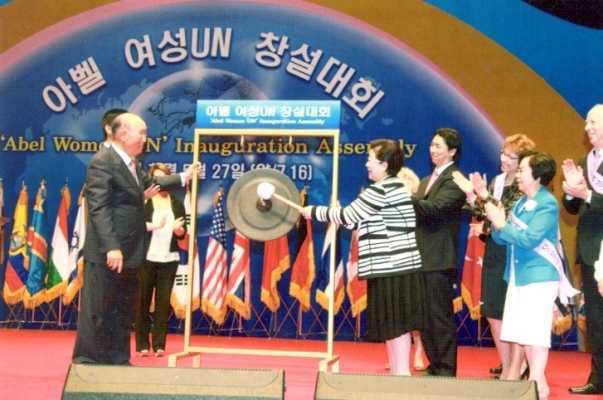 Women had come from all parts of the globe to participate in the inauguration of the Abel Women UN and many of them remained in Korea for the ten-day OSDP workshop True Parents held in support of the new organization. The fact is that the historic inaugural assembly of the Abel Women UN held today has been made possible through the declaration of the advent of the global era of women. Mrs. Hak Ja Han Moon and I declared that twenty years ago when we founded the Women's Federation for World Peace (WFWP) in April 1992 as a central organization of the women's peace movement, in accordance with Heaven's decree. The event, held at the Olympic Stadium in Jamshil, Seoul, was attended by woman representatives from some seventy nations and 150,000 Korean woman leaders. Since then, WFWP, which this year celebrates its twentieth anniversary, has established local chapters and a foundation for its activities in more than 160 nations and has continuously engaged in the global peace movement through creating networks for peace efforts. Furthermore, the goal of the Women's Federation was not to be another ordinary women's organization. It does not aim to be an external, political and combative women's rights movement mainly targeting men, which advocates expansion of women's rights, gender equality and the women's labor movement. Rather, it is a global peace movement on a whole new level with the providential significance of realizing the ideal world as God envisaged it at the Creation. Inaugurated against a background of such providential significance, during the past twenty years, WFWP has carried out service projects and education programs based on true motherly love, in all parts of the global village for the firm establishment of families embodying true love and the elevation of women's status. It has achieved amazing growth and development throughout the world. From the moment of its inauguration, Mrs. Hak Ja Han Moon and I have worked together as cofounders to prepare the ground for the global organization and foundation for WFWP activities. Moreover, WFWP members, including the 1,600 Japanese members who were sent out to 160 nations as volunteer workers in its early days, have carried out a peace movement around the world. At the WFWP inaugural assembly, my wife said in her inaugural message that now, under True Mother who has been victorious as the representative of women in the world, women should establish the model of a true mother and true wife and form ideal families through the true love movement. Furthermore, women should carry out an exemplary campaign of practicing true love by living for the sake of others in all walks of life, including politics, economics, culture and society. Accordingly, we have carried out a variety of volunteer projects and educational programs, as well as campaigns to bring about the resolution of international conflicts and reconciliation, transcending the barriers of race, religion, language and nationality. The inaugural event included UPF international president Dr. Thomas Walsh's congratulatory remarks and Carolyn Handschin's report on WFWP's work in relation to the UN; As MC for the evening, Women's Federation international president Mrs. Lan Young Moon warmly welcomed the international representatives and all others present. In addition, after the special address my wife gave at the UN headquarters in New York, in September 1993, and based on three years of hard work, the Women's Federation for World Peace was approved by the United Nations Economic and Social Council as an NGO in general consultative status, which is the highest status given to an NGO. Since then, our status has been reapproved continuously at the reevaluations held every four years. These entail strict assessment of activities and achievements. I believe it is safe to say that they recognize our true value, because among the more than 3,400 NGOs affiliated with the UN, only 140 have received this highest status. Our WFWP Women's Conference for Peace in the Middle East, which has been held every year since 1997, has attracted much interest and participation from woman leaders of the twenty or so nations of the Middle East. Now it has expanded and given birth to more concrete activities in the field, about which I am glad to be able to report. At the end of June this year, WFWP sponsored the sixteenth annual Middle East conference, which was held as a session of the Human Rights Council at the United Nations Office at Geneva, on the subject of Children Affected by Conflict and Disaster: Prevention, Protection, Healing and Empowerment. It was attended by woman leaders from eighteen nations in the Middle East, diplomatic officials including ambassadors to the UN in Geneva from nations around the world, and representatives from UN agencies and global NGOs. These 180 or so participants came together to seriously discuss current problems. I am informed that they resolved to apply the results of their discussions in the field. Furthermore, each WFWP chapter is also actively conducting relief aid work to address problems caused by natural calamities and poverty in various parts of the global village. In particular, under the slogan, "Let us share a little of what we have," they are carrying out the 1% Love Share Project to help children and women in North Korea, and I am very happy to tell you that they have achieved wonderful results. As can be seen, from the founding of WFWP to reaching the highest status as an NGO in consultative status under the UN, our members have never lost their founding spirit and have quietly pioneered the path of a woman's peace movement with an unwavering heart. Therefore, I would like to offer a big round of applause to express my infinite gratitude to them, and also to the woman leaders who have never held back in their encouragement or in their participation. However, the work for world peace WFWP has carried out until now should not remain at its current stage. It should be expanded and developed to the next stage, so that it can work together in solidarity and cooperation with woman leaders and NGOs from all parts of the world and strive to follow the path of the establishment of the ultimate world of peace. When the region that included the nations these women represented was announced, they stood as the audience applauded. In order to do that, WFWP should go beyond the level of a women's NGO, bring together the governments, organizations and individuals across the world and march forward. The establishment of a great organization under the name, Abel Women UN, is absolutely necessary to bring this about. It is, in fact, the absolute decree of God's providence. As we usher in such a cosmically historic and revolutionary era of changes, my wife and I solemnly declare the inauguration of the Abel Women UN. We urge all women in the world, who make up half of its population, to recognize their historic mission as stated above and to expand their work to all parts of the globe. Beloved woman leaders who seek peace! What is the path that humankind should take today? In the end, the problems afflicting humanity can only be resolved through the worldview of one family under God, which is the ideology based on true love that my wife and I, the True Parents, have learned from Heaven and have championed and taught throughout our lives, because these ideals alone represent the path that will lead humanity to a world of everlasting peace and happiness. We are now living in a historic time for a great cosmic revolution to change history, to unite the spiritual and physical worlds and to create the ideal kingdom of heaven that God has longed for since the beginning of time. We can no longer postpone or delay it. Heaven has already proclaimed that the thirteenth day of the first month in 2013 will be Foundation Day. Therefore, it is time for all people to be humbly obedient to Heaven's decree. I hope you will bear in mind that a fateful time is today approaching, and that we need to devote ourselves completely with a life or death commitment for the remaining time under the guidance of True Parents, who are carrying out the providence on earth as the substantial selves of God, the king of peace. Father and Mother took turns sounding a gong to launch the Abel Women UN. The course for humanity is set. Now that we have D-day, which Heaven has given us through True Parents, what reason is there to hesitate? We now have less than a year. Heaven will bless your endeavors to establish a world of peace based on the Abel Women UN. However, I would like to emphasize again that the priority of the Abel Women UN should be creating a true family movement that emphasizes living for the sake of others based on true love, and carried out in conjunction with education in proper values. War and conflict arise from selfish motives -- desiring to take others' land, others' possessions or the like, by force. On the other hand, peace arises from investing oneself for the sake of others -- that is, giving based on true love. Those leaders who turn their faces away from the new realities of the world, or who fail to see them, will be cast aside by the changes coming upon us like a tsunami. I believe the time has now come for us to step forward boldly and receive new opportunities and values. Women are not here merely to help or to be protected by men; rather, they are independent individuals who as representatives of the feminine aspect of God's nature are meant to make men more complete and manly. Centering on true love, women are men's precious love partners. Men and women are absolutely equal in terms of value. I sincerely ask you to choose True Mother's path, the path of a true wife, the path of true daughter, and the path of a true woman leader who will build a unified world where freedom, peace, and happiness in its truest sense, overflow. Ladies and gentlemen, you have listened closely right to the end of my speech. I pray that God's blessing will be with you, with your families and with your work.